I looked out this morning and saw a bird hanging from the suet feeder. Now generally, they are hanging ON the suet feeder, not hanging out of it. 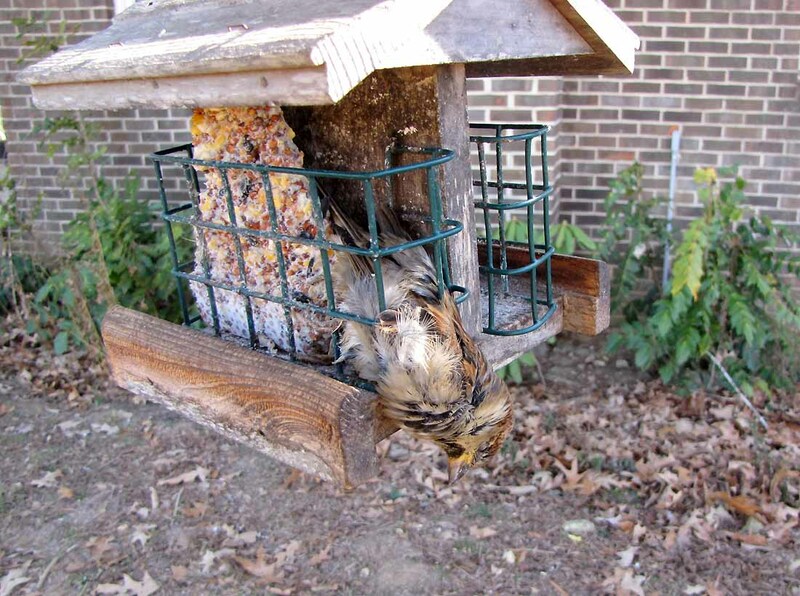 I’ve had that suet feeder hanging out there for probably 10 years, and never had this kind of thing happen before. Since I doubt this little bird had a death wish or was executed by other birds (“Push him through the mesh and hang ’em!”)… I can only assume it tried to get down inside the wire basket to get the suet, then tried crawling out through the wire mesh and got stuck. Evidently the idea of going in reverse didn’t occur to its little birdbrain. Or maybe it was so tightly stuck it couldn’t back out. So it got stuck and froze to death.